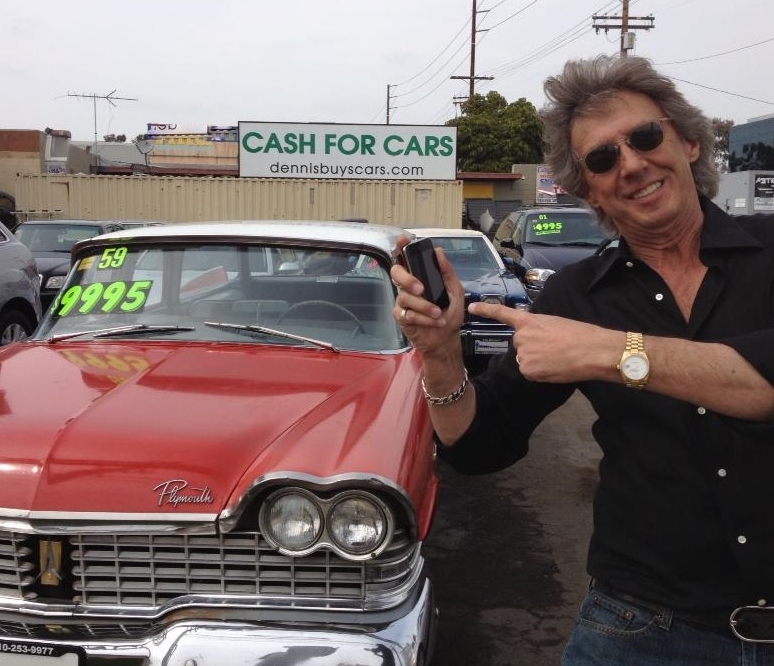 When it comes to sell vintage cars, Dennis Buys Cars is LA’s number buyer of classic cars, trucks and motorcycles. Do you have a classic car that you need to sell? Have you inherited a classic car and don’t know where to start? Call us now, you will be glad you did. We are the trusted experts and we can help. It’s very simple. Call us and give a brief description of what you have. We will determine its condition and what options it may have. Then we can determine what it’s worth. Don’t Deal with IDIOTS on Craigslist! Next we will decide if you can get the car to us or not. If it has not run for a significant period of time then we can come to you and asses your classic car. Many times we can do the transaction just by pictures alone. In that case we can make an agreement on the phone and send a truck with payment to pick it up. It’s that easy! Sell your classic cars to a licensed and bonded dealer like us only. Don’t deal with strangers coming to your house! There are too many potential risks involved when you try to sell your car privately. We Will Make it Safe, Quick and Easy! First is the time factor. It’s not that simple selling your classic car privately. You have to clean it up, take pictures, write a compelling ad and wait for people to call. Half of the time you will make an appointment, rearrange your busy schedule and they don’t even show up! Next, you have too get it running properly. If the car has been sitting for awhile that can be quite daunting. Furthermore, when you sell your car privately you leave yourself open for liability. Either the new buyer might not register in his name in a timely fashion or he might not put it in his name at all. These unlicensed dealers disguise themselves as private buyers then attempt resell your car. When this happens your title with your name on it could be floating around from person to person and in many cases from country to country! Also, many times sellers make innocent mistakes when describing their classic car in various advertising forums. Let’s say the buyer finds out that it doesn’t have the original engine like your grandfather told you for example. Or maybe it had rust underneath that you didn’t know about. Now that your buyer knows where you live, nobody wants an angry stranger banging on your door wanting their money back. I have heard of this happening. The final problem is getting paid safely. You cannot take a check of any kind. Even valid cashier’s checks can be stopped the next morning. You won’t find out until a month later when suddenly your bank will clean out your account to cover for it and your car is long gone. The ONLY way to get paid safely by a stranger is with green cash and that even has its risks. The bills could be counterfeit and who wants to count out cash in a Starbucks with a complete stranger! Save yourself the hassle and sell your classic car to us! We will make it safe, quick and easy! Check our Yelp reviews, videos and testimonials and you will see for yourself! We are the final destination point when it comes time to sell vintage cars. Finally, we also sell vintage cars. We have cool classic cars, trucks and motorcycles for sale. Just check out our inventory, there might be something there you like! Dennis: Today we have Mei and Liz, two very lovely people. So Liz and Mei, tell us about this car that you’re selling today. Liz: Well, this car is a 1988 Mercedes 560SL and its actually been in the family for a while, but today we decided to find a really good buyer for it, so we decided to sell it to Dennis. Dennis: Great! So tell us the history of the car. You’re telling me earlier that it was one of your family member’s car? Liz: Yes, actually it was my grandfathers car, then it became my mother’s car. It’s a really special car. Dennis: It’s been sitting here since 2011, so obviously it’s not an easy thing for you to sell it today, right? I understand that. Liz: Yes, but you came by today and offered us a really good price and it was a very, very pleasurable and enjoyable experience dealing with Dennis Buys Cars, so we decided to go forward with this purchase or transaction. Dennis: Thank you so much, we really appreciate it. Tell us why you decided to sell your car to a dealer as oppose to selling it privately. Liz: Well, the car needed some work and is much easier to sell it to a dealer as oppose to dealing it privately and having to fix it up ourselves. It’s really something we are not very familiar with, so we thought that it would be much more convenient to do it this way. Dennis: And no need to have strangers coming to your door! Liz: Correct! Except for you. Dennis: Well, we are not strangers anymore. Hopefully we are friends now. Dennis: Tell us, how did you find Dennis at Dennis Buys Cars? Liz: That would be through google, we just typed in the key words sell vintage cars and you were the first to pop up. Dennis: So you typed in sell vintage cars? Liz: Correct, sell vintage cars. Dennis: And it worked! It got me here. Dennis: Thank you so much, we really appreciate. Anything we can do for you in the future car wise, internet wise, let us know , our doors are always open.